Added by Citizen Reporter on October 10, 2014. 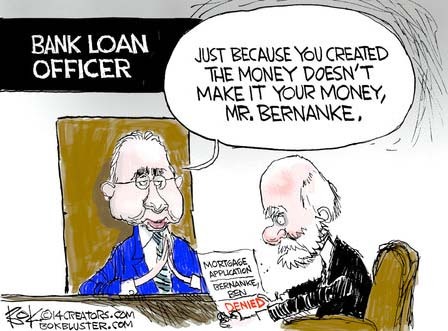 Tags: bailout, banking, Ben Bernanke, bokbuster.com, Chip Bok, economy, Fannie Mae, Federal Reserve, Government, mortgage, Uncategorized, Wall St.
Editor’s note: Chip is one of our new writers- a talented cartoonist as well as political commentator. He was out here in SoCal this week attending an editorial board meeting for Investor’s Business Daily. People like this don’t work for free, so would you help us with our new trial Adopt-a-Reporter program? If you like and would be willing to help support a writer, DONATE and send us an email referencing the donation, which will be earmarked for the purpose you specify. Let us know what you think of his work via reader comments here or by email. We encourage you to visit his site- http://bokbluster.com, read, enjoy and click on the links. This material is copyrighted and may not be reproduced without permission. Editorial cartoonist Chip Bok has worked has appeared in The Times of London, Chicago Tribune, Washington Post, New York Times, Los Angeles Times, Time, and Newsweek, before hitting the big time with Investor’s Business Journal and Citizensjournal.us. He won eight industry awards that we know of including Time Magazine top 10, National Cartoonist Society and Pulitzer Prize Finalist. Bok is a graduate of the University of Dayton. He lives in Akron, Ohio, with his wife, Deborah. They have four children.